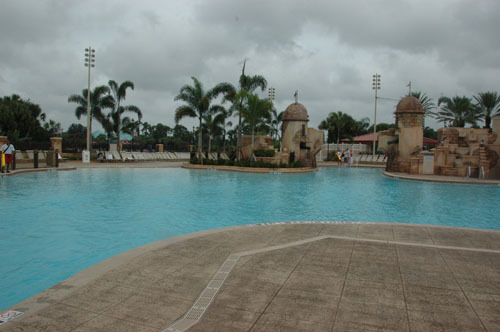 The main pool at Caribbean Beach resort in Walt Disney World has opened. 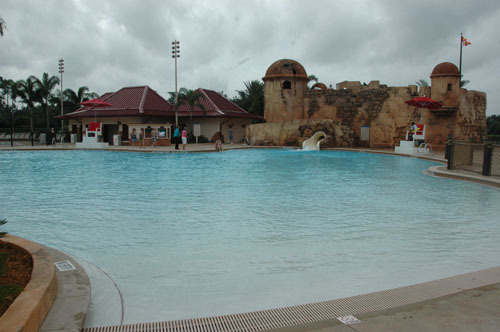 The pool was totally redesigned and the pool complex is much larger. It has been closed since January 2008. Caribbean Beach is my favorite Walt Disney World resort. I have lost track of all the times I have stayed there. A complaint often heard was the pool was too small for the size of the resort. Well I can say that won’t be a problem any longer. The new pool is much larger than the previous pool. 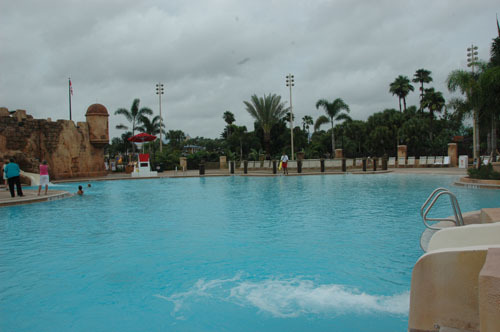 It also has zero entry making it easy for everyone to enter the pool. The pool has a pirate theme. 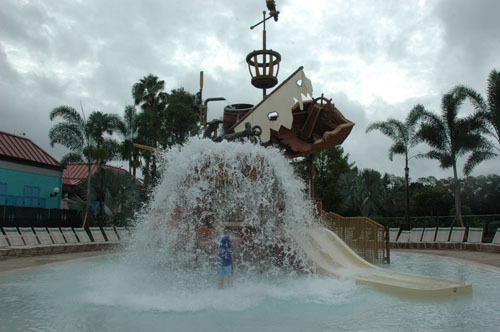 There is a pirate fort with a slide and another short slide that was part of the previous pool. The old cannons in the shallow end are rumored to squirt water. The kids will have lots of fun things to play on. The adults should like the new pool complex also. There are a lot more lounges so it should be easy to find a seat. The bathrooms are much larger than they used to be. There is a nice shower if you need to use it. Women will appreciate the large mirror in the bathroom. There is a hot tub and a cool spa. 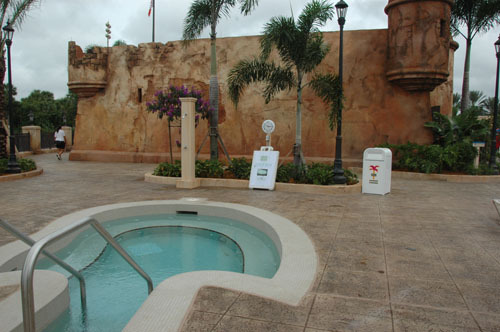 The cool spa is in a quiet area behind the pirate fort. I do think the kids will love the new kids pirate slide area. There is a bucket that fills up with water. When it is ready to tip you hear a clanking sound. As it speeds up you know the water will be dumped. The kids area is fenced off from the main pool with plenty of lounges for parents. 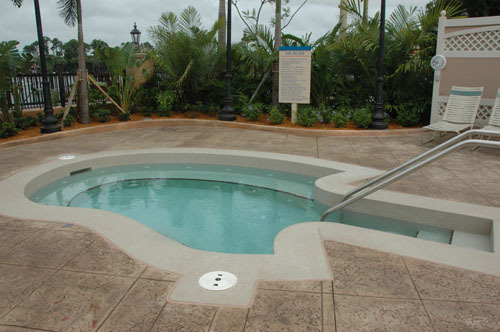 If you have stayed at Caribbean Beach before the new pool will feel familiar to you. 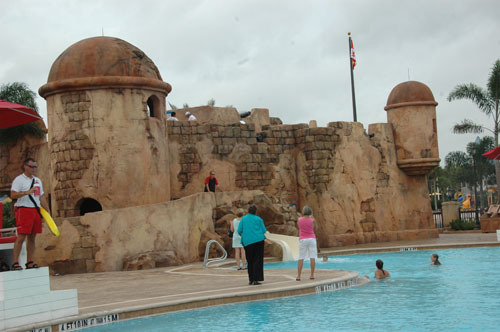 Once again Disney listened and improved the pool. 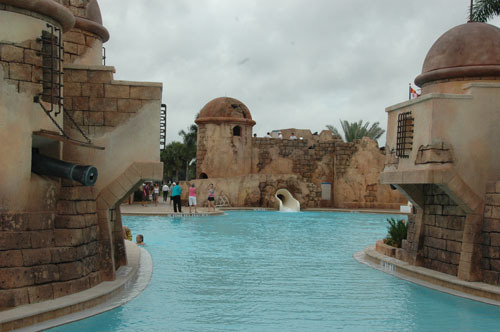 Banana Cabana is still there for those liquid refreshments and Old Port Royale the food court is just a few steps away. 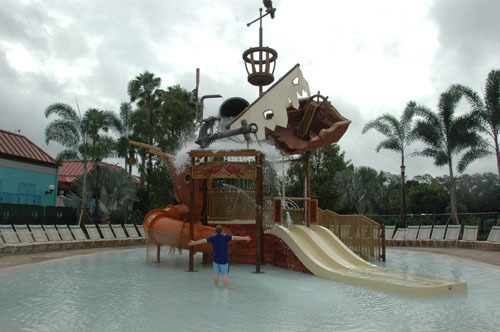 Starting in January 2009 you will be able to stay in a pirate themed room at Caribbean Beach. If you have little ones that are really fascinated by pirates you may just have to book a stay here. I have a feeling that CBR is going to become a lot more popular moderate choice for many families. I can’t wait for my CBR stay.